Desh Bhagat University Faculty of Nursing, observed two-week long AIDS Awareness Programme with the theme “Closing the gap in HIV prevention and treatment”. Students in large number from all Nursing classes along with their teachers took part in it with full zest and zeal. 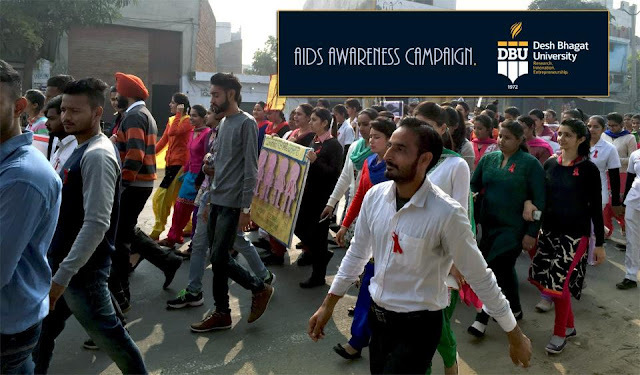 The students organised “AIDS Awareness Camp” at Community Health Centre (Amloh), Civil Hospital, (Fatehgarh Sahib), and several another places. To mark the event, the students displayed posters on AIDS awareness at these places and performed role play on AIDS to make the public aware regarding the prevention of the disease. During this drive, Dr. Gurditt Singh Sodhi (Civil Surgeon, Fatehgarh Sahib) and Dr. Alka (SMO, Amloh) also addressed the public and appreciated the students for this highly informative movement on AIDS. 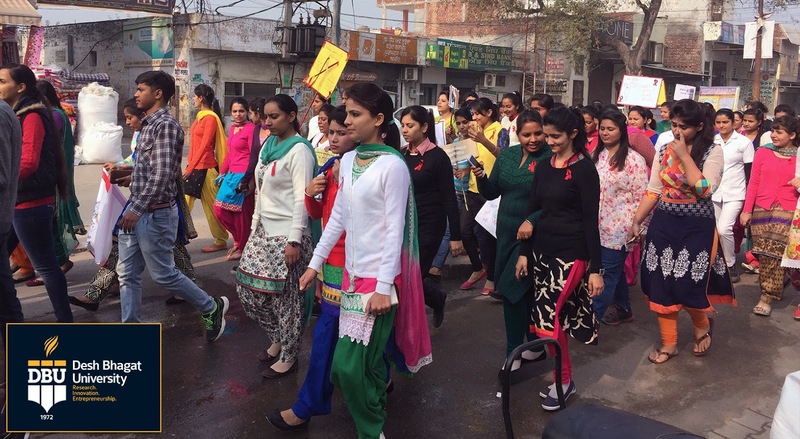 Director Faculty of Nursing Dr. Ramandeep Dhillon said that apart from this, the students also arranged Nukaar Natak and mini rallies at different places on ‘Myths related to AIDS’. 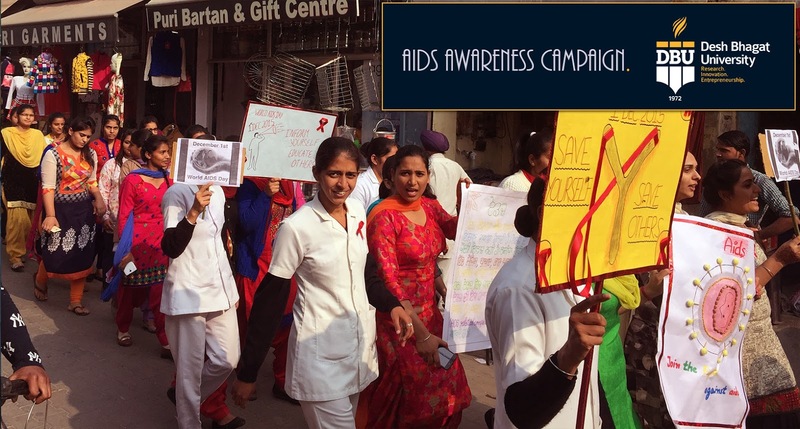 Colourful banners and placards with awareness messages were carried by the students to change the public perception about AIDS. Desh Bhagat University Chancellor Dr. Zora Singh and Pro Chancellor Tejinder Kaur inspired the students to undertake this drive and appreciated them for their efforts to make the community aware about this dreadful disease by organising such events. They also exhorted the students to start a decisive drive against Aids and drug abuse through posters and awareness rallies. The people appreciated the students for working to enhance this noble cause. They said that such programmes are very helpful for the youth, especially for the rural area youth to create awareness against this dangerous disease. Ms. Parneet Kaur (Assistant Professor), Ms.Jasmine Kaur (Assistant Professor), Mr. Prabhjot Singh (Assistant Professor) and Mrs. Amanjeet Kaur (Assistant Professor) accompanied the students during this campaign.